Ansonia Clock Co. porcelain clock, "LaDon". In a Royal Bonn case, so marked on the back with the red stamp. 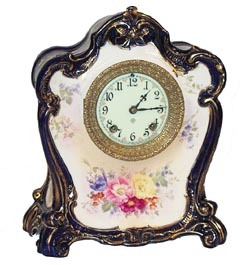 The case is Cobalt Blue with agenerous amount of gold paint, flowers in the center and sides. It is 12inches high, 9-1/2 inches wide. The case is open behind the top piece thatlooks like a bird or something. 8 day, half hour gong strike, Rocco sash, beveled glass. Case is perfect, clean, polished, running. From the Millercollection of fine Ansonia clocks.